Los Angeles Kings head coach Marc Crawford provides NHL.com with his thoughts on the Penguins exciting triple-overtime victory over the Red Wings in Game 5 of the Stanley Cup Final and looks forward to what should be an extremely entertaining Game 6. Get your Detroit Red Wings primary logo tee now! 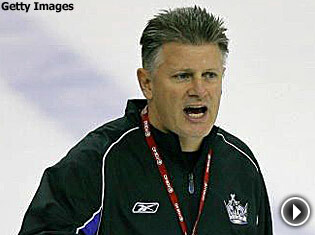 Los Angeles Kings coach Marc Crawford knows what it takes to win the Stanley Cup. As a player with the Vancouver Canucks, Crawford advanced to the Stanley Cup Final in 1982 before his Canucks lost to the Islanders. As a coach, he won the Stanley Cup, leading the Colorado Avalanche to the 1996 crown, defeating Florida in four games. Now the coach of the Kings, Crawford has agreed to share his expertise with NHL.com, breaking down the 2008 Stanley Cup Final between the Detroit Red Wings and the Pittsburgh Penguins. In his exclusive NHL.com analysis of Game 5 at Joe Louis Arena – a game that may be remembered as one of the most dramatic hockey games in recent memory – Crawford breaks down the game and offers his own unique insight on the game and the series. "It was a classic, definitely, and if the Red Wings won it would've been a fitting end, but obviously this has got the Penguins right back into this series and right now, man, it's anybody's ball game," he said. Watching the game with his coaching staff in an Los Angeles-area sports bar, Crawford, his coaches, and the rest of the patrons knew they were watching something special. From a 2-0 lead, to a 3-2 deficit, to an emotional last-ditch effort by the Penguins to tie it up, the game was up for grabs for 60 minutes of regulation, and throughout a Herculean three overtimes that left players, coaches and fans alike physically and mentally exhausted. For Crawford, it was easily the most entertaining game of the entire 2008 playoffs. And as impressed as he was with the Penguins, specifically Ryan Malone and Marc-Andre Fleury, he was just as impressed with the Red Wings' performance in Game 5. "This is a hardened, battle-tested Detroit Red Wings hockey club and they know how to play, they know how to get themselves up they know what has to happen and it's not just in their star players, its in their role players and their veteran players and really it’s been passed on to their young players," he said. "The big ticket now is to try and park the game and recuperate as much as you can and get ready for the battle of Game 6," he said. * The impact of fatigue on both the Red Wings and the Penguins, and the difference in how that fatigue will be managed by two very different teams. * The emergence of several Penguins as true leaders. * Ryan Malone and Sergei Gonchar's gutsy performances in getting back on the ice after suffering serious injuries, and what that will mean moving forward. * And finally, as a coach, what can be said, if anything, to keep a team in the Red Wings’ shoes from getting down on themselves and what can be said to a Pittsburgh team to keep them level-headed and focused on Game 6 at home.